It will compliment me as being such an extraordinary writer and providing such a useful blog. It will be full of sentences mined from the net or just put together its own sentences with subjects, verbs, adverbs, adjectives, and such pushed together to make a sentence that almost makes sense. Reading a paragraph of such sentences and trying to determine content will drive a person mad. End of line. Jump. It will simply be full of links. Actually, they ALL have links. But this third variety will have nothing but. --I propose new legislation banning any October advertisement that includes any variation of the sentence: "[Nouns] so [adjective], it's scary!!!" EG: "Prices so low, it's scary!!" "Food so good, it's scary!!!" Pull the advert; they're done for the month. The dress was a costume dress that she'd picked up at a Goodwill for three dollars. The blood was some of her daddy's stage blood left over from graduate level blood spatter experiments. 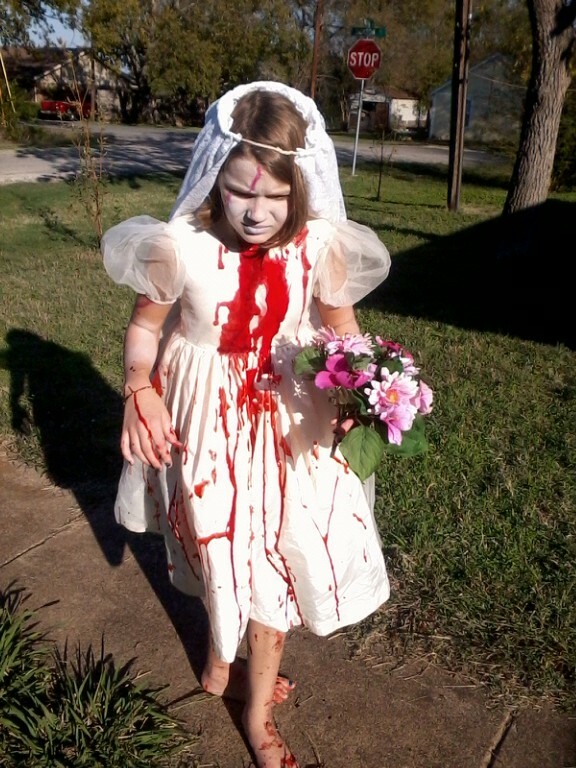 She's miserable in that pic, because the stage blood, having been left in the garage, was about 55 degrees, and she was made to stand out in the fresh Halloween air to let it dry. She was cold. --Kids over 11 who arrive at my door tonight out of costume get no candy. Kids under 11 may get some candy, but they'll be told we disapprove, and that they need to sing for their supper. Also? They get the crappy candy, like Dumdums, or Good-n-Plenty. --I will actually be working an off-duty gig this evening for a couple of hours, controlling car access to an affluent community. Seems that the rabble locally less-affluent have discovered that their high-rolling neighbors give out the Good Stuff, and they all like to bring their kids. Problem: left to their own devices, man parents won't walk the sidewalks with their little kids; they will drive along beside them. This results in the hazard of people driving the streets while looking out their passenger side window, on the very night when there is the highest likelihood of a sprog darting out in front of their vehicle. My job will be to direct such parents to park their cars at the convenient lot near the entrance to the 'hood, and invite them to take a stroll with their costumed charge. Such service will be rendered with a big ol' Officer Friendly grin. I have been assured that I am to be compensated quite well for this. --It's to be 73 degrees at 6:00 PM today, with a dry 5 mph breeze from the north, and not a cloud in the sky. The moon is only waning two days past full. It will be a delightful evening for a stroll with friends. --When I was about 13, my best friends' parents attended a church that taught that Halloween was evil. I was invited to a Halloween party with their youth group, and found to my dismay that they were all praying for the souls of all those kids who were caught up in the Satan-worshiping that surely accompanied the act of dressing up and unintentionally celebrating dark arts. The television show 20/20 had just done a big exposé on the apparent rampant spread of Satanism and people were wringing their hands all over. In retrospect, I think that there could have been no greater reward for the mullet-wearing teens with cans of spray paint and hopes of getting the townsfolk all scared, than that they would receive such coverage. --I've just had that crappy Mötley Crüe song playing in the background while typing. It's no longer scary, nor does it sound that hard (it was mostly unlistenable to teen aged Matt G). It just sounds kind of crappy. Also? The metal umlauts are dumb. Yeah, I know-- I'm getting old. *I had seen him get up and walk out of the campsite, and I hopped up and ran to catch up. He was a couple of years older and a minor hero of mine, but I was aware that he also had a naughtier streak, too. To this day, I have no idea if he actually had a destination in mind. I think maybe he was hoping to get the two miles to the highway and get to a convenience store for some cigarettes. **Yeah, this is the Richard Shindell version with Cry Cry Cry, but I think that the lyrics are clearer than the original Robert Earl Keen, Jr version. Also, yes, I'm aware that the song was written later in 1997, about some kids who almost got implicated for the 1995 Oklahoma City Bombing, but the phrase has resonated in my head many times throughout my career, when I have run across some light-runnin' malefactors who distracted me from my search for real evil-doers. Stay safe, and watch out for the idjit parents... If they can't follow along, they're liable to dump the kids out and drive off. And we get us some autumn for Halloween.